China's Central Military Commission held the country's largest ever maritime military parade in the South China Sea on Thursday, which for the first time featured the country's aircraft carrier strike group and the most advanced weaponry of the Chinese People's Liberation Army (PLA). 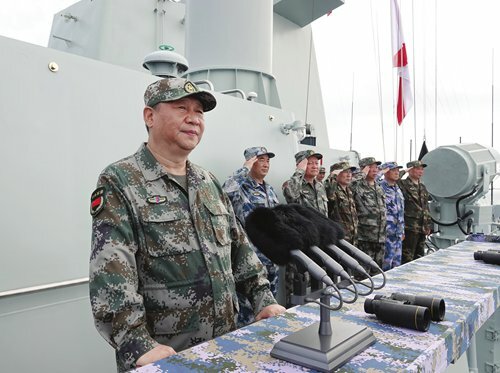 Chinese President Xi Jinping, also general secretary of the Communist Party of China (CPC) Central Committee and chairman of the Central Military Commission reviewed the warships and addressed the PLA sailors, PLA Daily reported. Xi said the need to build a strong navy "has never been more urgent than today," and he called for efforts to build a first-class navy in the world, the Xinhua News Agency reported. Forty-eight warships, 76 aircraft and more than 10,000 sailors and soldiers took part in the parade which was hailed as "the biggest maritime military parade since the foundation of the People's Republic of China in 1949 and a heroic display of the PLA Navy in the new era," the PLA Daily reported on Thursday. It was the first maritime military parade held in the South China Sea and to be open to the public. China's aircraft carrier, the Liaoning, joined the parade for the first time. All combat systems of the PLA Navy and 10 air echelons joined the parade. The most advanced warships, including the Liaoning, type 052D destroyers, type 052C destroyers, type 071 amphibious transport dock and type 093 submarine took part in the parade," Song Zhongping, a military expert and TV commentator, told the Global Times on Thursday. The parade showcased the PLA's aircraft carrier group and its enhanced combat capability in the high seas, said Song, adding that China's upgraded navy signifies the PLA is not afraid of war and is capable of winning any battle. "China's strength in protecting its national maritime interests has grown. The Thursday parade could also serve as a deterrence to maritime hegemony, making adversaries think twice before attempting to harm China's core national interests," Song said, adding that the parade was also an education on national defense and patriotism. China Central Television (CCTV) reported on Thursday that destroyers involved in the parade were sailing to the Taiwan Straits where they are to conduct drills. China's Fujian Maritime Safety Administration announced live-fire drills would be conducted in the Taiwan Straits on April 18. 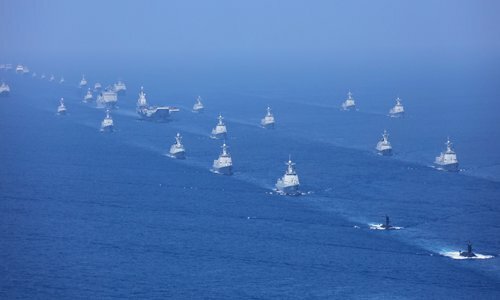 Holding the parade in the South China Sea was a strategic move as the waters are a potential combat zone, Li Jie, a Beijing-based naval expert, told the Global Times on Thursday. He noted that the US aircraft carrier USS Theodore Roosevelt operated in the South China Sea on April 10. Footage streamed on CCTV showed soldiers and sailors dressed in battle fatigues, which indicated that the parade was also a real combat training exercise, Li said. Strengthening the PLA Navy's combat capability in the South China Sea is an important strategy, a military expert who requested anonymity told the Global Times. Despite joint efforts made by China and Southeast Asian countries on easing South China Sea issues, some Western countries keep provoking China's sovereignty in the area, he said. Some countries which are the real threats to regional security may accuse the PLA of "flexing its muscles" or "militarizing the South China Sea," said Song, adding that they have no right to make irresponsible remarks about China's efforts to protect its core national interests. Another military source who requested anonymity told the Global Times on Thursday that the US has been playing the South China Sea card for a long time, but it will soon lose its impact. No one can prevent China from claiming reasonable and legal rights with its rising strength, the source said.